A selective series of booklets featuring just eight famous named trains; these consisted of route maps, locations, descriptions of the lines etc, and some black & white photos. A combined volume for parts 5-8 was produced, but I've not seen any evidence of a similar book for parts 1-4. The first six were originally priced 6d (sixpence), while parts 6-8 were 9d; all were later priced 9d (except for the combined edition). I've included the repriced editions here. 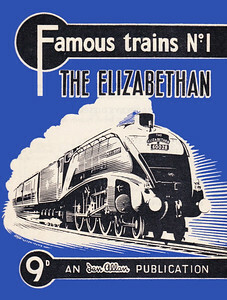 Famous Trains No.1 The Elizabethan, published 1955, 28pp 6d, no code. A N Wolstenholme drawing of A4 Class Pacific 60028 on cover. 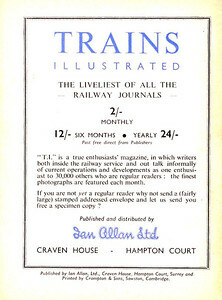 Famous Trains No.1 The Elizabethan, published March 1959, 28pp 9d, code: 896/526/10/359. A N Wolstenholme drawing of A4 Class Pacific 60028 on cover. Note: two variants of the 9d edition: one (probably the first of the two) carried no code, the other coded as above. 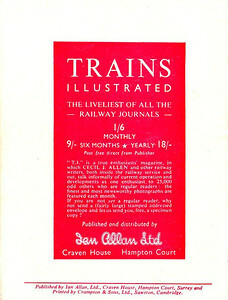 Famous Trains No.1, 9d, rear cover variant #1 with no code. Famous Trains No.1, 9d, rear cover variant #2 with code 896/526/10/359. 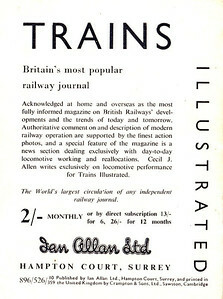 Famous Trains No.2 The Royal Scot, published 1955, 28pp 6d, no code. A N Wolstenholme drawing of 'Coronation' Class Pacific 46221 "Queen Elizabeth" on cover. 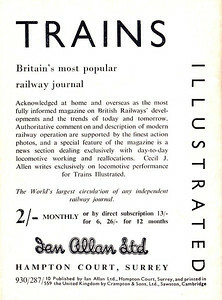 Famous Trains No.2, 6d, rear cover. 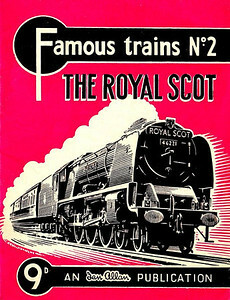 Famous Trains No.2 The Royal Scot, published March 1959, 28pp 9d, code: 8965/26/10/359. A N Wolstenholme drawing of 'Coronation' Class Pacific 46221 "Queen Elizabeth" on cover. Famous Trains No.2, 9d, rear cover, showing code 8965/26/10/359. Famous Trains No.3 The Cornish Riviera Express, published 1955, 28pp 6d, no code. A N Wolstenholme drawing of GWR 'King' Class 4-6-0 6021 "King Richard II" on cover. 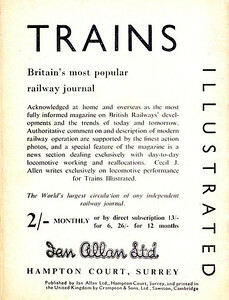 Famous Trains No.3, 6d, rear cover. 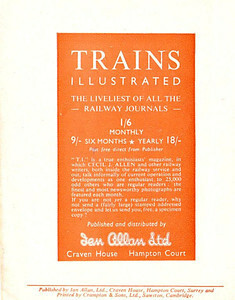 Famous Trains No.3 The Cornish Riviera Express, published May 1959, 28pp 9d, code: 930/287/10/559. A N Wolstenholme drawing of GWR 'King' Class 4-6-0 6021 "King Richard II" on cover. The exact same code was used for the 9d edition of Famous Trains No.5. Famous Trains No.3, 9d, rear cover, showing code 930/287/10/559. The exact same code was used for the 9d edition of Famous Trains No.5. Famous Trains No.4 The Atlantic Coast Express, published 1955, 28pp 6d, no code. A N Wolstenholme drawing of unrebuilt 'Merchant Navy' Class Pacific 35025 "Brocklebank Line" on cover. 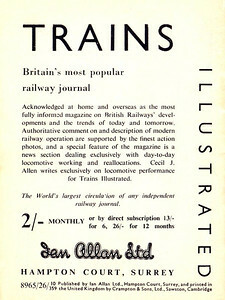 Famous Trains No.4, 6d, rear cover. Famous Trains No.4 The Atlantic Coast Express, published 1959, 28pp 6d, no code. A N Wolstenholme drawing of unrebuilt 'Merchant Navy' Class Pacific 35025 "Brocklebank Line" on cover. 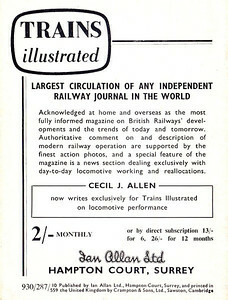 Famous Trains No.4, 9d, rear cover, no code. 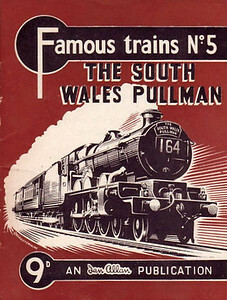 Famous Trains No.5 The South Wales Pullman, published November 1955, 28pp 6d, code: 495/247/20/1158. A N Wolstenholme drawing of a GWR 'Castle' Class 4-6-0 on cover; this is the only 6d edition with a code. 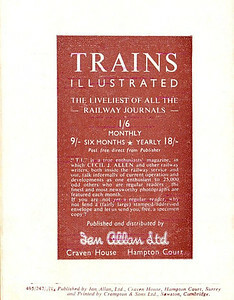 Famous Trains No.5, 6d, rear cover. Famous Trains No.5 The South Wales Pullman, published May 1959, 28pp 9d, code: 930/287/10/559. A N Wolstenholme drawing of a GWR 'Castle' Class 4-6-0 on cover. The exact same code was used for the 9d edition of Famous Trains No.3. Famous Trains No.5, 9d, rear cover, showing code 930/287/10/559. The exact same code was used for the 9d edition of Famous Trains No.3. 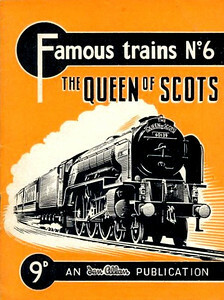 Famous Trains No.6 The Queen of Scots, published January 1956, 28pp 9d, code: 510/366/200/156. A N Wolstenholme drawing of A1 Class Pacific 60139 "Sea Eagle" on cover. Reprinted March 1960, code: 293/1003/10/360. 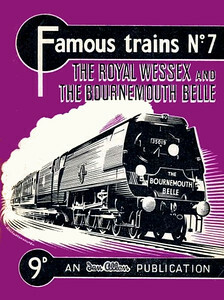 Famous Trains No.7 The Royal Wessex & The Bournemouth Belle, published 1956, 28pp 9d, no code. A N Wolstenholme drawing of unrebuilt SR 'Merchant Navy' Class Pacific 35019 "French Line CGT" on cover. Reprinted May 1959, code: 930/287/10/559. 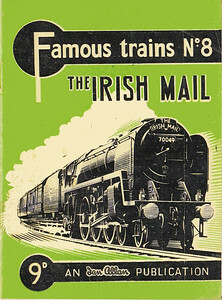 Famous Trains No.8 The Irish Mail, published July 1956, 28pp 9d, code: 511/366/200/756. A N Wolstenholme drawing of BR 'Britannia' Class Pacific 70049 (later to be named "Solway Firth") on cover. Famous Trains (Combined Volume, Nos.5-8), published 1956, 120pp 2/6, no code. A N Wolstenholme drawing of BR 'Britannia' Class Pacific 70049 (later to be named "Solway Firth"") on cover. There doesn't appear to be a Combined Volume for Nos.1-4, strangely. 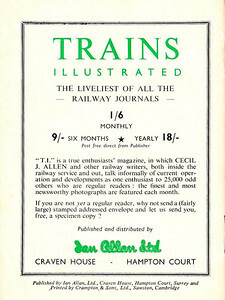 This book consists merely of the four books bound together with a different coloured cover of FT No.8, with the appropriate train names stamped on. All four sections include their covers, so the relevant codes appear throughout the book, therefore the rear cover is that of 'No.8 The Irish Mail, and so carries the code 511/366/200/756, although this code gives no clue to exactly when this edition was published, other than 1956.